All of Razorback's World War II Deck Logs, from April 1944 through September 1945, have been scanned and converted to Adobe PDF files (as a bonus, we've also got the deck logs for October - December 1945). The Deck Logs complement the Patrol Reports well, because the Deck Logs provide an even deeper look into the training of Razorback's crew as well the day-to-day conditions aboard an American submarine, deep inside Japanese waters, during World War II. AIMM would like to thank Calvin Moon, former Razorback WWII crewmember for copying these deck logs at the National Archives and sending us the copies. Look for more stuff in the coming weeks! The July 2009 issue of The Submarine Review, published by the Naval Submarine League, has arrived at the AIMM Library. "The Development and Evolution of the FBM System - A Class of 1946 Cold War Story"
"The Role of Polaris Submarines in the Cuban Missile Crisis"
AIMM has just finished digitizing the 1968-69 and 1970 WESTPAC Cruise books for USS Razorback. Each of these books contains photographs of the crew and their adventures in the Pacific. Digital copies of the books are now available for purchase in our gift shop. A CD with both Cruise Books is $12, including postage. CDs will be shipped in a padded envelope. CDs can be ordered by calling the museum at 501-371-8320 or dropping us an e-mail. We can accept checks, Visa, Mastercard and even Paypal. "On the morning of the 15th of July, at about 7 o'clock" (a.m.) "we were suddenly aroused...The first words I heard were "the Rebel ram Arkansas is coming down upon us."... "Around us lay the combined power of Farrgut's and Davis's fleets. Frigates, gunboats, iron-plated boats, wooden rams and iron-cased rams were anchored along the banks for a mile and a-half." "And slowly steaming along the hollow of the bend in the river, just above us, was a long, low, dull, red, floating object." "Slowly, steadily, gallantly, the Rebel Ram kept on her way, as though she belonged to us and was quietly choosing an anchorage." "The Benton, Hartford and gunboats below poured a perfect shower of balls upon her." "It did not even hasten her speed, and proudly she turned a point, disappeared from sight and anchored under the batteries at Vicksburg." Yet even damaged, Arkansas' mere presence was enough to cause the Union forces problems. One of the mortar boats in the Union fleet ran aground and rather than even risk capture, it was set on fire and allowed to blow up. The Union fleet was forced to keep steam up constantly, which in addition to quickly burning up the available supplies of coal, also greatly added to the discomfort of the hot Southern summer. 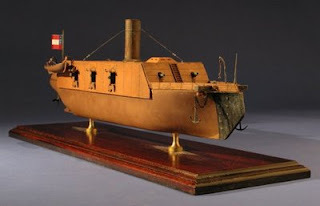 Photograph of CSS Arkansas model courtesy of Old Steam Navy, Dallas, TX. Lower artwork courtesy of the Naval Historical Center. Construction work on CSS Arkansas began in Memphis, TN in October, 1861. She was supposed to have been delivered to the Confederate Navy by January, 1862. However, she was still incomplete in May 1862, when Union forces closed in on Memphis. In order to prevent her capture, she was towed up the Yazoo River into Mississippi to the area of Greenwood, MS. Her incomplete sister ship, CSS Tennessee, was burned when Memphis fell to Union forces. It was hoped that, safe from capture, the much-needed warship could be quickly completed. However, when her newly appointed Commanding Officer, CAPT Isaac N. Brown arrived, he found the engines in pieces, the guns without their needed carriages and the railroad iron, intended as armor, lying at the bottom of the river. CAPT Brown ordered a recovery mission and the armor was pulled out of the mud. CAPT Brown then had his ship towed to Yazoo City, MS, where he pressed both local craftsmen and 200 Confederate Army soldiers into service as construction crews. Forges were borrowed from nearby farms. Men who refused to work were arrested. After five weeks of toil under the Mississippi summer sun, Arkansas was fully outfitted, lacking only the curved armor intended for her stern and pilot house. Complete or not, the ship had to get underway - river levels were falling, and Arkansas was in danger of being trapped. On the morning of 12 July 1862, 147 years ago today, CSS Arkansas, her guns manned by Confederate soldiers from Missouri, set out for Vicksburg, then under siege by Union forces. 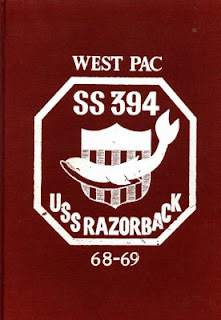 USS Razorback's deck logs for 1948 have been scanned and uploaded to the website. These deck logs provide a window into the world of submarine operations in the period immediately following World War II. Each month is a separate Adobe PDF file. The deck logs can be found on the AIMM Website. The following completes a reprint of an article originally published in the April-June 2001 Issue of American Submariner Magazine, the official publication of the U.S. Submarine Veterans, Inc. and reprinted with the author's permission. Another time, we were submerged and I was in the middle of serving the second sitting for the noon meal. All was well. The crew was muttering their usual complaints about the meal while asking for seconds. The Exec had the Conn, and I heard the command, “Prepare to snorkel”. One of my mess cooks was qualified, and he immediately started to assist me in rigging the After Battery for snorkel (I had just made Commissaryman Second Class). We finished the checklist, and I yelled into the Control Room, “After Battery rigged for snorkel”. Minutes later, I heard the Exec give an order that I had heard hundreds of times, “Commence snorkeling”. The quiet of the boat was shattered by the familiar sound of diesel engines coming alive. Suddenly, the entire sequence was interrupted by the groaning, high-pitched sounds of exhaust gases desperately searching for an outlet. This was followed by an extremely loud sequence, which meant that hot air was giving up its attempt to escape, and was retreating back to the engine housing. There was total silence as all of the engines shut down. I looked directly overhead at the snorkel exhaust valve. The indicator was in the “locked” position. I began to think many things. Why did I volunteer for submarine duty? Would it be possible to swim back to port? Were there any openings in my old anti-submarine squadron? I heard the Exec yell from the Conning Tower, “Who is the duty cook”? “Barksdale”, yelled my ‘friends’ in the Control Room. “Ask Barksdale to come up to the Conning Tower”, bellowed the Exec. I stepped through the after battery hatch into the Control Room desperately trying to think up a logical reason why the snorkel exhaust valve was not in the “Power” position. I was brain dead. As I looked at my “buddies” in the Control Room for help, it suddenly appeared that I had been stricken with bubonic plague, as no one seemed to know me. There were many giggles. The Exec was a good guy, but he was very unhappy, as the Division Commander was in one of the surface craft monitoring our movement. He reminded me that I had just made Second Class, that I wore the Dolphins of a qualified submariner, and strongly suggested that I would have neither if the Razorback was not snorkeling in a very short period of time. Needless to say, all was well when we received our second command to “Commence snorkeling”. Several months later, I was able to redeem myself from all of my past transgressions. Yes, it was during the noon meal. We were working with aircraft. They were the cat, we were the mice. Up and down, up and down, all morning. My most important job, as the duty cook, was to yell into the Control Room as we dove, “Main Induction shut and locked”. This particular morning, the Chief Gunner’s Mate was working the Christmas Tree (yes, we had a Gunner’s Mate and a Boatswain’s Mate on the Razorback. Now take that, you Nukes). The diving alarm sounded, and I looked up at the main induction. I started to shout, “Main Induction shut and loc…”, when I noticed that the main induction had just shifted to the “Open” position. I yelled into the Control Room, in a voice that could be heard in Brooklyn, “Gunner, you just opened the main induction”. Things happened fast. “Blow the forward group. Blow the after group”. It was the fastest surface that I ever remember. I received an “Atta boy” from the Captain, Exec, COB, and many others. I still do not like the noon meal, and when friends and associates ask me to “do lunch”, I usually reply, “No thanks. Been there, done that”. The following continues a reprint of an article originally published in the April-June 2001 Issue of American Submariner Magazine, the official publication of the U.S. Submarine Veterans, Inc. and reprinted with the author's permission. “No sir”, I replied. “I’m just trying to cook the noon meal”. Two-pound cans of black pepper were no longer allowed on the U.S.S. Razorback. The following is a reprint of an article originally published in the April-June 2001 Issue of American Submariner Magazine, the official publication of the U.S. 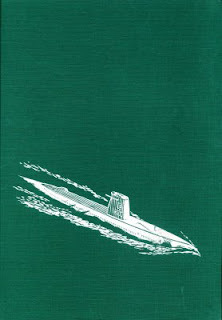 Submarine Veterans, Inc. and reprinted with the author's permission. I graduated from submarine school in December 1960, and was assigned to the USS Razorback (SS-394). The Razorback was operating out of San Diego, California, which made me very happy. I had spent the first two years of service as an “airdale”, at the Naval Auxiliary Air Station, Kingsville, Texas. I was ready for sea duty. One of these days I will tell you how I went from an anti-submarine patrol squadron to submarine duty-but that can wait. I received my “Crow”, as a Third Class Commissaryman while in sub-school, and I was prepared to create great meals for my new shipmates. The Razorback was an old diesel boat that had been converted to a guppy snorkel. To me, she was beautiful! The crew was funny, friendly, and extremely competent in submarine operations. The first thing that I was told, after reporting aboard, was that we were heading for “Westpac” in three weeks. I said, “What’s Westpac?” We stopped in Pearl Harbor, Guam, Chichi Jima, and finally arrived in Yokosuka, Japan. I was very familiar with the Razorback by then, and was well along my qualification schedule. All of my shipmates helped me to understand the nuances of the Razorback. By the time we made it home to San Diego, I was close to completing my qualification sheet, and I knew the After Battery like the back of my hand. I qualified in September, 1961. The Razorback had three cooks. One stood the bake watch, and the other two rotated the daily cooking chores. I loved to bake, but I usually stood cook watch. I never liked cooking the noon meal. Something would always go wrong. Breakfast was fine, soup and sandwiches for the afternoon watch was fine, the evening meal was fine; however, I always had problems with the noon meal. Once we were operating out of San Diego with a Destroyer squadron, and I heard the diving alarm. Instead of the usual down angle, we must have stood on our head at ninety degrees (well, maybe not ninety degrees, but it seemed like it.) All of the noon meal ended up on the galley deck. I was very unhappy. Another time, we were submerged, and the diving officer decided that it would be a good time to practice the “Emergency surface” drill. Once again, the noon meal stopped on the galley deck. I yelled at everyone in the control room, but no one seemed to be impressed. If You Weren't Here, You Missed a GREAT Party! AIMM and WAND co-operated for the annual 4th of July picnic and fireworks viewing this past Saturday. This is an annual event which supports both the museum and the construction and maintenance of the Beacon of Peace and Hope, which is being built at Riverfront Park.